A lifetime interest in greyhounds and involvement with the racing industry was loaded into several worn boxes containing piles of dusty magazines, dog-eared newspapers and clipped articles, and years worth of racing programmes. When my greyhound’s original owner offered this collection to me upon his retirement, how could I refuse it? The heritage and pedigrees of my own dogs as well as my friends’ greyhounds were contained somewhere in those boxes! It would just require some detective work to find out some of our greyhounds’ ancestry as well as bits and pieces of racing history and information. Here are some of the fascinating tidbits about greyhounds and greyhound racing that I have gleaned from my new-found treasure trove. One of the most unique things about greyhounds is that they come in so many different colours. Being amid hundreds of greyhounds at a reunion or picnic is like looking at a wallpaper design book or a huge patchwork quilt. Each colour has its own uniquely beautiful quality. But, which colour is thought to be the rarest? According to the article, dark brown is the most unusual colour. There are no gray greyhounds–a point of amusement for many unfamiliar with the breed (“Why are they called GREYhounds, then?”). What is the closest marking of a greyhound to being gray? According to the author, light brindle is the closest greyhound marking to being “gray.” However, this has proved to be a controversial point among greyhound owners to whom this question was posed. Most maintained that “blue” or “blue fawn” is closest to being gray. I also learned some very interesting points about greyhound racing from these magazines. If you have any of your greyhound’s racing records, you will notice many abbreviations and unusual phrases in the racing cards. These comments are used to describe your greyhound’s performance in a particular race. This section will help you decipher some of the most common phrases that are used. Occasionally, a racing program comment will say “overland route.” This means that the greyhound ran very wide around a turn. Another comment you might see is “came again.” This phrase is used to describe a greyhound that relinquished the lead but then tries to regain it at the stretch. If a greyhound “flew the turn” it means that the greyhound leaving the starting box didn’t follow the proper curve of the first turn. A greyhound that “falls off the tailgate” did not get tossed from a pick-up truck! Rather, this term means that the greyhound went from first to last place in the race. A greyhound that “missed the break” failed to leave the starting box with the rest of the field. Dogs that “miss the break” probably will be waiting for you in the track’s adoption centre after the race. The abbreviation “W.L.” in a racing program denotes that the dog was a weight loser. Early in their career, racing greyhounds are given a racing weight (and most adoptive owners know that their retired greyhound should stay within five pounds or so of that weight). The racing weight is set by the trainer after the pup officially “schools in” (trains to race) and is ready to start racing for real. This weight can be changed two or three times during the meet. There are rules that specify how much a dog can vary from its set weight. 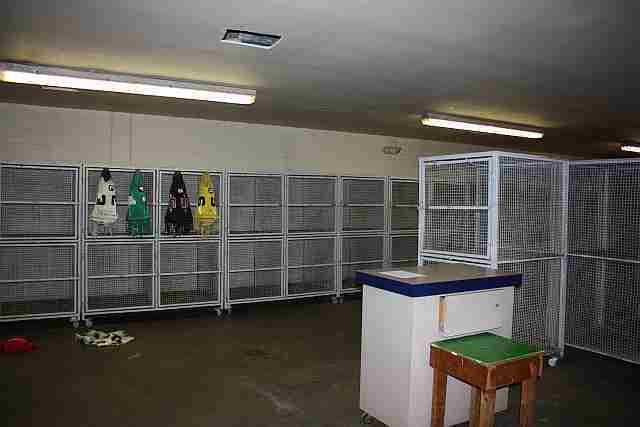 On race day, the greyhounds are taken from their crates and kept in an area referred to as the “jinny pit.” This is where the dogs are weighed, checked over by the vet for soundness, and blanketed (at most tracks, in numbers 1 through 8). The dogs are kept in the jinny pit to guarantee that the greyhounds are not switched or given any illegal or performance-enhancing substances. There are rules that specify how much variance can occur after weigh in and before racing. For example, a dog weighs in before racing at 70 pounds. It is put in the jinny pit. It is weighed again before going out onto the track. If it has lost more than two pounds while in the pit, it has to be scratched from the race. W.L. is used to denote a dog that has previously lost more than two pounds and by doing so it can avoid being eliminated from competition that day. Adopters who have obtained an N.G.A. pet certificate, which lists the adoptive owner’s name in the N.G.A.’s database, probably will have heard the term “bertillon card.” On the reverse side of the pet certificate is a diagram of a standing greyhound with your own dog’s markings drawn in detail. Even the colour of each toe nail is noted! The “bertillon card” is also used at the track to help identify each dog. If there is anyquestion about a dog’s identity, the racing official can refer to the bertillon card to verify the identity. The bertillon card is one measure to ensure that dogs are not switched before the race. Perhaps the most interesting fact I came across was this: At Harrison, Ohio in the 1930s, Olympic track star Jesse Owens raced against a greyhound for 3/16th of a mile (about 300 metres). Who won? My common sense says “The greyhound, no question about it!” Racing greyhounds are capable of running 5/16ths of a mile (approximately 500 metres) in about 30 seconds. In 1936, Jesse Owens ran the 100 metre dash in 10.3 seconds. Imagine my disbelief when I read that Jesse Owens had won this race by a step! I suppose we are assuming the race was fair. I can’t help wondering if Jesse have a head start? Did the greyhound have a mechanical lure to chase? Were the greyhounds of the 1930s that much slower than the greyhounds of today? This last piece of trivia seems to raise more questions than it answers. * Many thanks to Marshall Ansin for verifying some of the racing terms used in this article.